I had seen a post on Markus KD0JKM's Blog about a grasswire antenna. So why not give it a try. I had some left over ribbon cable to make a 100 ft loop. I used two conductors in parallel. It is easier to handle that way. I laid the loop on the yard directly on the grass. I called a few stations and did not snag them. But I found I had some Reverse Beacon spots. 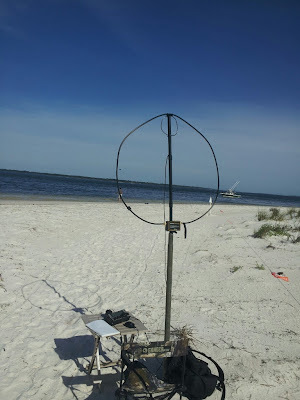 Then I raised the loop using 20 ft poles and make a contact with Wink WA8KOQ in Sevierville TN. Now that was nice because I later setup the loop at about two feet off the ground. I found Wink on the air and he gave me the same 579 and said about the same as first QSO. So I'd say the two foot high loop does pretty good. I got a number of RBN spots for it on 20 and 30 meters and I worked WA2HMB Don in SC on 40 meters. I think this qualifies the two foot high loop to be in my catalog of portable antennas. The grasswire loop is inviting me to get a actual contact. Markus did make some contacts on his that was six inches above the ground. I could see using Reverse Beacon Network as a great tool to experiment with grasswire antennas. I can imagine some emergency scenarios that you have to make do with no supports. I read that in WW1 if the antenna supports were destroyed they could still communicate with antennas on the ground. 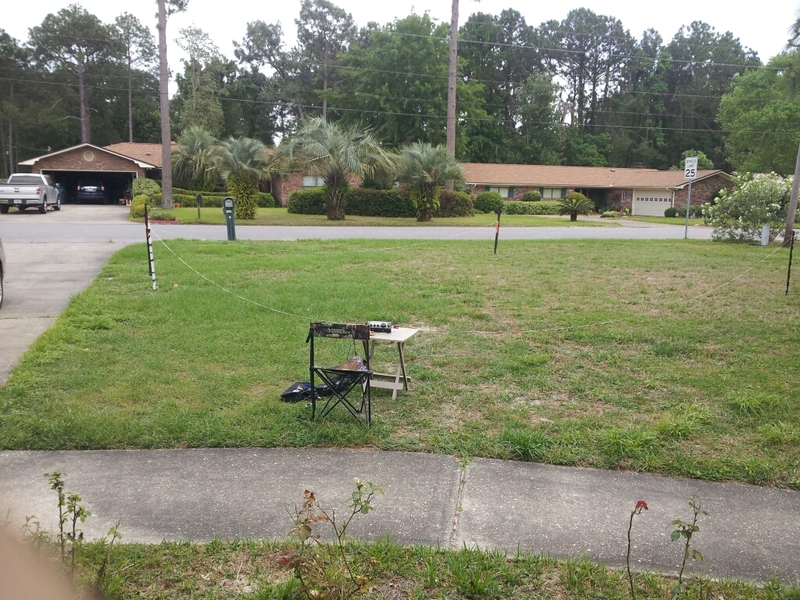 My friends Marv KK4DKT and Phil KK4DWI have started using Slinky dipoles for portable ops. I had purchased a Slinky antenna off of Ebay a long while back and never used it. It was one Slinky instead of two. So having Slinky envy, I have tried a Slinky vertical. The Slinky is stretched over sixteen feet of military fiberglass mast. This is supported by the hitch mount of the truck. I used an existing counterpoise made of ribbon cable with quarter wave conductors for 40. 30, 20 and 17 meters. The resonance seems to be about 6.6 MHz. It tuned on 40 meters but did not tune well on 20. So to make this versatile I added my Balun Designs 9 to 1 Unun in conjunction with the KX3 internal tuner. Now it tunes 40 meters through 10 meters. Next, I did a quick test to see if it works. I snagged the International Marconi Day station KM1CC on 17 meters. Then I had a good QSO on 30 meters with WA8KOQ. Now his antenna was an eleven foot gutter and he was S9. I got a S7 with my 5 watts. So they say you can tune bedsprings, a gutter, or a Slinky I suppose. This configuration would be good enough to work out of a parking lot without much of a profile. So perhaps I'll try it for lunch break ops. I could see running a longer coax to the back seat for inclement weather. After the RaDAR ops on April 6th and the weather being nice I could not resist returning to St. Andrew's State Park on Friday April 12th. I wanted to go to the Sandy Point area of the park because it is surrounded by salt water in the most directions. 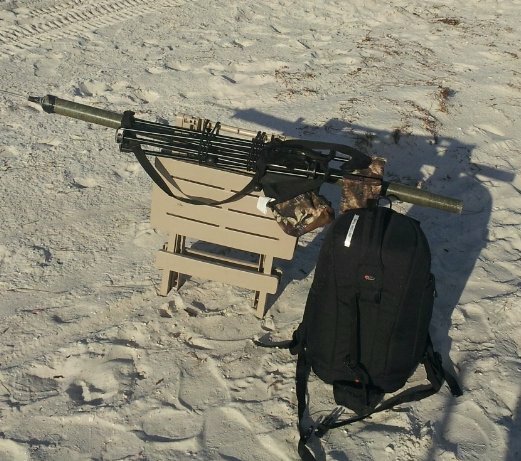 In RaDAR fashion I proceeded to walk 1.3.km to the point with my backpack, chair, table and short pole. I setup the KX3 and Alexloop and decided to try 17 meters. I chose 18.132 SSB and was able to CQ and hold the frequency for a little over an hour. QSOs included OH, TX, NJ, VA, MA and TX again. The last QSO was N5SKH who was also using a KX3. The ten watts did the job with reports from S5 to S9. I'd say the saltwater was a plus. The traffic was mostly fishermen and they wanted to know if the loop had any influence on the fish. I am afraid not, but the right net on the loop might come in handy for landing the big one Hi Hi! 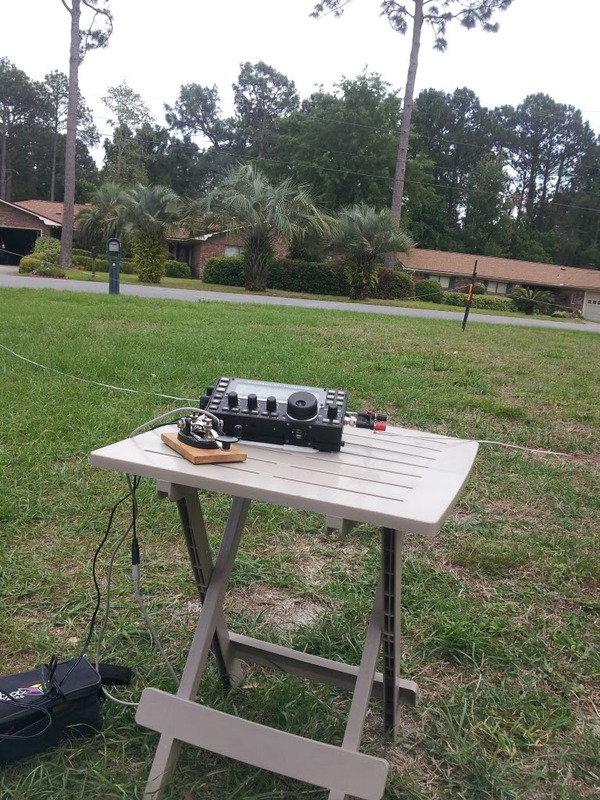 I had the most fun I can remember in Ham Radio. RaDAR America is a new contest that originated in South Africa. Marcus KD0JDM brought it to America. The emphasis is Rapid Deployable Amateur Radio. The most unique part is the mobile and pedestrian mobile require you to move after 5 contacts. Pedestrian mobile requires you to move .6 miles or 1 kilometer after making 5 contacts. There will be a follow-on contest the first Saturday in November. 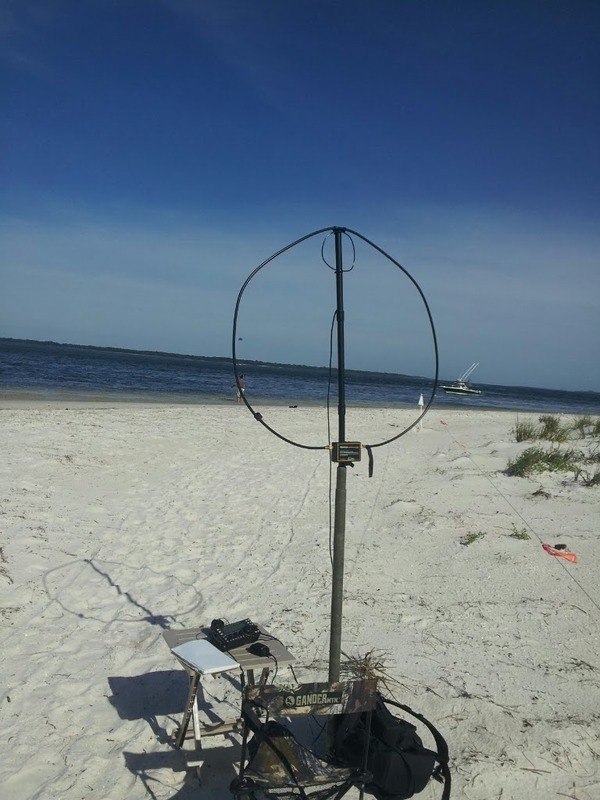 For this contest it all came together with an outstanding site St Andrews State Park near Panama City FL and perfect weather, clear skies and 70 degrees. We had a cool breeze that made it nice. The park has lots of white sand beach. 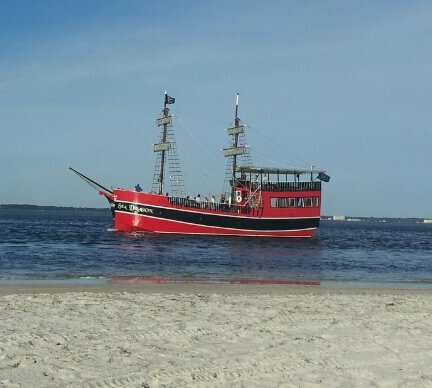 I started at 9 AM at the Jetties where there is a pass from the Gulf of Mexico to St. Andrews bay. This was grid square EM70DC. NVIS 0 to 400 miles on 40 and below get bonus points so I chose 40 meters. I figured I better use a NVIS antenna so I used a 88 foot NorCal Doublet made from ribbon cable. Now it was a bit funny signing /PM with antenna that size. I had forwarned some buddies of mine and they showed up including Tom WD0HBR in Dothan, Kelly K4UPG in Orlando, Jim K4LIX and Bob WB4BLX in Panama City. Jim was mobile participating in RaDAR also. Then I also worked Diz W8DIZ in Dunedin FL. The sixth contact I did not count was Allan W4MQC in Pine Island FL. 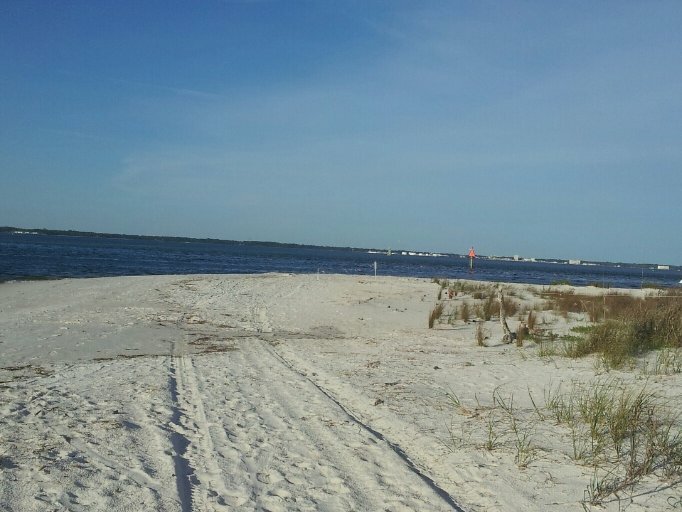 Then it was time to move and I went up the beach one kilometer toward Sandy Point EM70DD which is low and lots of bay front. This means salt water. I got as close to the water as I dared with the KX3. I setup the Alexloop and tuned up on 20 meters. The QRP ARCI contest was in full swing. I worked two TX stations K5HDX and WA5RML. 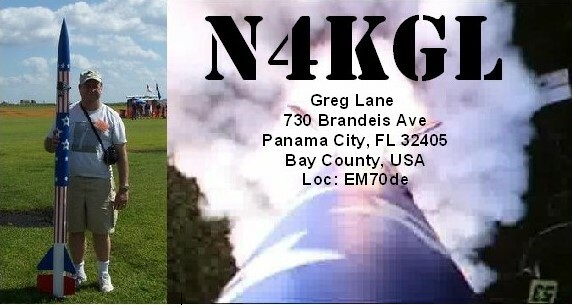 Then I ran into K4LIX in Panama City followed by NG2T in NY and W4MPS in NC. Now time to walk one kilometer back to the Jetties. I checked in with Marv KK4DKT president of the Panama City ARC. He was operating RaDAR portable fixed. Harold KD4YDO from the club was there also. Anyway it was lunchtime and I had about 45 minutes left. I chose to operate from a gazebo overlooking the Jetties. I decided to try 15 meters and I snagged EA2LU as first contact. This was followed by K3MD in PA, N1HFE in NH and WD7Y in NV. I wanted to make the fifth contact in the last few minutes but it was not to be. So four hours of sun and fun. It is great when time, place and a hobby all come together. I certainly enjoyed it and thanks to Marcus KD0JDM for making this happen. Also thanks to Elecraft and Alexloop. The KX3 and the Alexloop are a perfect combo for rapid deployment. The Elecraft KX3 is a FB rig. Alexloop in Gazebo. Worked Spain from there on 15 meters.